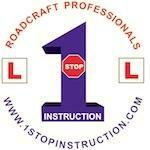 1 Stop Instruction www.1stopinstruction.com Review | Really good motorbike school! Really good school! They do an excellent job and they will teach you from the start, if you don't know anything about bikes. He will teach you properly and if you listen what he has to say, it will save your life when you finally get your hands on your own bike. Only mentioned those 3 guys as I had great experience with them buy the whole Team is fully Professional and the company is great! Highly recommend 1 Stop Instruction.